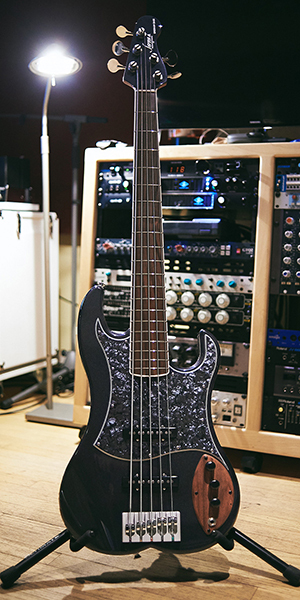 The Chatham is the most straight-forward bass model we offer. 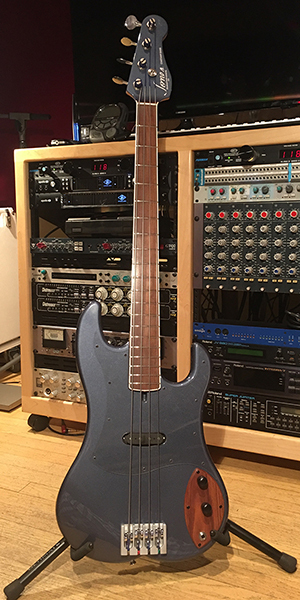 One pickup placed midway between the end of the neck and the bridge provides a deep round sound profile that produces a low bark when the bass is played slightly more aggressively. If you’re looking for a great all-around sound particularly suitable for rhythm and blues, rock and roll, and jazz the Chatham is worth checking out. The Gresham bass is Jones Musical Instruments’ deluxe two pickup model. It is infinitely alterable for several genres of music. The perfect choice for everything from infectious funk to rootsy reggae or from electric jazz to virtuoso fusion. This instrument also features a slimmer neck that facilitates tackling more difficult passages. 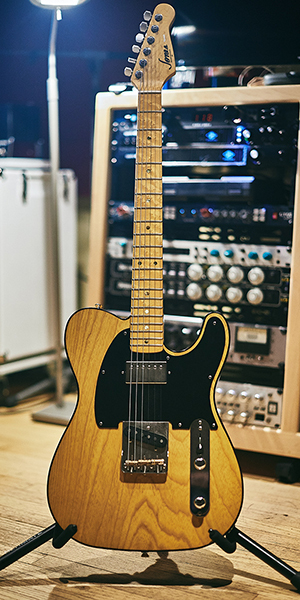 The Telham is our 6 string model that’s reminiscent of the 50s/60s vintage, bolt on neck, dual pickup (neck and bridge) that players as diverse as Keith Richards, Roy Buchanan and James Burton have made famous. Our standard model features a humbucking pickup in the neck position like Keith’s infamous Macabre, but it is of course available with a standard single coil pickup in the neck position if you so desire. The Stratham is our take on the triple, single coil pickup model that the late great Jimi Hendrix made the go-to guitar for nearly every rocker or shredder since. For those that know the secrets of pickup and volume knob gymnastics this guitar produces a never ending choice of sonic colors. Crystaline brightness, soaring lead tones and funky rhythmic crunch. We want to build your dream guitar. Tell us your deepest desires. Darryl is offering four different models that hearken back to the classic vintage guitars and basses of the 1950’s and 1960’s, and each can be customized with many options to satisfy individual players’ sonic and aesthetic desires. Want a bigger, chunkier neck? No problem. Do you prefer custom-wound pickups by a favorite designer? All you need to do put us in touch with them. Do you like the worn look of vintage relics? We can do it! Want a super light body? Your wish is our command. Want to play the guitar you saw Darryl play in Havana with the Stones in 2016? It can be yours! If you are interested in ordering a Jones Musical Instrument and would like to get more information about the customization options for your bespoke bass or guitar, please fill out our order form. 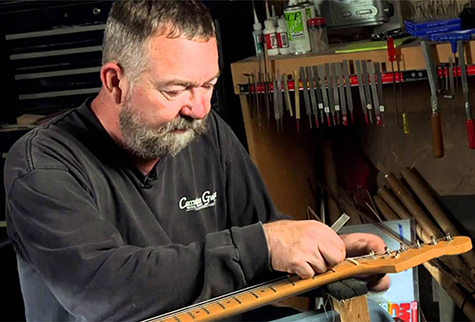 Jones guitars and basses are custom-built by master guitar maker John Carruthers who has worked on or built instruments for countless artists around the world. John worked with Fender on the designs and implementation of the Eric Clapton, Jeff Beck, Jimmy D’Aquisto, Robben Ford, all Vintage Reissues and the Acoustic lines of guitars. 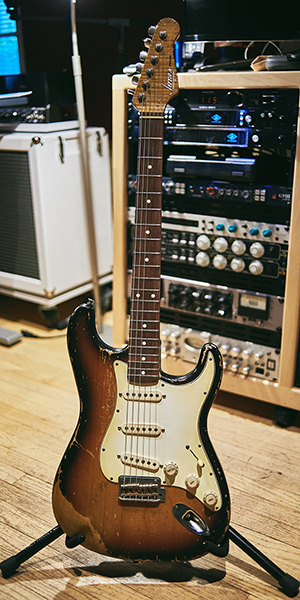 Upon Leo Fender’s death, John was given the honor to make a limited 600-count run of bodies of the Leo Fender Commemorative Guitar Model for G&L. John also helped Ibanez design and improve many of their guitars including the Joe Pass model, and the Artist Series guitars and basses.